HomeAppleDownload ODIN for Mac OS X (Jodin3). In this simple guide today we will let you know how to Download ODIN osx (Jodin3) on your computers running the Mac OS x. Though there are a lot of guides about the installation of the older version of Odin on Mac, but non of those work right now, just because the latest updates brought more hurdles for such programs to install and work properly on Mac OS X. So that you can play with ODIN tool on your Macbook, iMac, MacBook Air, MacBook Pro etc. But before moving any further, you all need to know what actually ODIN is and how it works. Latest ODIN has been found as the only tool for the Samsung devices to Flash, Root or installing recoveries or flashing them into the Samsung Stock Android devices, so many of you who have a Samsung Galaxy smartphones might know about this application. In short its a tool for Samsung devices to let you change your Android device according to your Wishes, no matter which ever Samsung Galaxy phone you have, with this tool you can flash a whole new ROM into it and make it look like any other Stock loaded Android device. You can now play with your latest Samsung devices firmware or Rooting, whether its the Latest Samsung Galaxy S9, S9 Plus, Galaxy S8, S8 Plus or even the Galaxy Note 8. In short you don’t have to wait for the Official OTA Android 8.0 Oreo update. You can get it if you get the firmware guide Online. To remain updated Follow our Custom ROMs, Root Guides in How To’s category. The same tool, ODIN MAC is mainly used as Jodin3 for 2018 and has been available for quite some time now due to the works done by an XDA developer which has successfully ported this version on Mac OS. We expect this to be relatively trouble-free. However, there are some stumbling blocks. First, ODIN for mac OSx requires a PIT file, which can be automatically obtained, but it requires a device reboot. Jodin3 will walk you through this process. On windows, drivers should be auto-installed. On Mac, Heimdall will be auto-installed. On debian-based Linux, Heimdall will be automatically installed and you will receive in-app instructions on all platforms. Now coming to our main guide here, We will try to maintain this guide as simple as we can so that you fully understand this step by step guide about downloading Odin for Mac which is best suitable to be called JODIN3 for Mac. First of all you should prepare yourself with all the pre-requirements or tools that we are going to need for a successful installation of Jodin3 on your mac devices. It contains the following. Third and most important is that you should not have Samsung Kies application on your computer. Now once you get all these apps ready to go, you should gather these tools too which includes the USB Cable. Or you can have any WiFi connector but that will not work once the device reboots and can cause bricking your device. 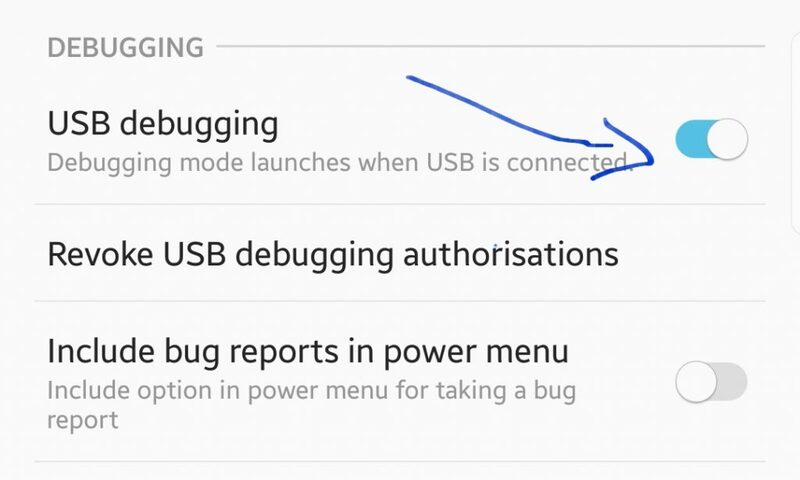 Along with above mentioned tools make sure that you have removed the Samsung Kies app from your MacBook, or Mac, and your have enabled the USB Debugging Mode on your Samsung Galaxy device by following these steps. Once developer options enabled, the phone will show a small message on screen. You can see the images below for guidance. Now coming the most needed thing her after all those pre-requirements is the official Jodin3 version for your Mac os which you can download below. For the best offline version of the Jodin3 you can click on this link below and install it on your Mac OS. Because its the offline version given below, you won’t need any real help in installing it on your device. The installation method given by the developer on the official XDA forum has some lengthy procedures but we are here with much more shorter way of Installing or flashing your Samsung devices with this application on your Mac. All you need is follow the step by step guide given below. Now you can look for the .tar.md5 file which are mostly known as the official firmware file extension of the packages for the samsung devices. Once done you can simply put your Samsung device on Bootloader mode by pressing the usual Power + Volume down + Home key . Now all you have to do is simply plug it on the computer. Before clicking on the Start make sure that you have clicked the Auto-Reboot option and all other options are unchecked. Now you can click start and you will have your desired packages flashed on the Samsung devices and once the flashing completes your device will reboot automatically. That’s it. . Once downloaded and installed here you can get a helpful guide about Flashing Custom Rom on Samsung devices and other ODIN Tool related links. To get the Latest ODin 3.12.7 for Windows 10/7/8/XP Laptop or Desktop PC, click on the link below. Hope you have Successfully downloaded and installed Samsung ODIN for Mac or Jodin3 2018 tool on your Mac Book or iMac running latest OS X.